Polycystic ovary syndrome (PCOS) is a hormone problem in women. With PCOS, the ovaries make follicles but they don’t mature and release an egg each month. The follicles can turn into fluid-filled sacs called cysts . The cause is not known. Insulin resistance seems to play a role. It creates high levels of insulin. This causes the ovaries to make too much of a male hormone called androgen. This can result in male features. It can stop ovulation from happening. 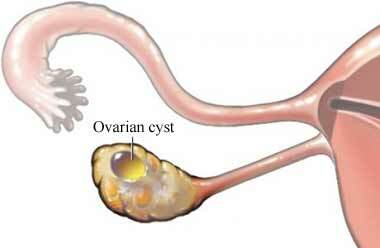 It can lead to large ovaries with many cysts. Urine tests to check for pregnancy. ACOG Committee on Practice Bulletins—Gynecology. ACOG Practice Bulletin No. 108: Polycystic ovary syndrome. Obstet Gynecol. 2009;114(4):936-949. Reaffirmed 2015. Baillargeon JP. Use of insulin sensitizers in polycystic ovarian syndrome. Curr Opin Invetig Drugs. 2005:6(10):1012-1022. Glintborg D, Altinok ML, Mumm H, et al. Body composition is improved during 12 months' treatment with metformin alone or combined with oral contraceptives compared with treatment with oral contraceptives in polycystic ovary syndrome. J Clin Endocrinol Metab. 2014;99(7):2584-2591. Li XJ, Yu YX, Liu CQ, et al. Metformin vs thiazolidinediones for treatment of clinical, hormonal and metabolic characteristics of polycystic ovary syndrome: A meta-analysis. Clin Endocrinol (Oxf). 2011;74(3):332-339. Polycystic ovary syndrome. American Academy of Family Physicians Family Doctor website. Available at: http://familydoctor.org/familydoctor/en/diseases-conditions/polycystic-ovary-syndrome.html. Updated April 1, 2015. Accessed July 25, 2018. Polycystic ovary syndrome. EBSCO DynaMed Plus website. Available at: http://www.dynamed.com/topics/dmp~AN~T116286/Polycystic-ovary-syndrome . Updated June 18, 2018. Accessed July 25, 2018. Polycystic ovary syndrome (PCOS). Endocrine Society Hormone Health Network website. Available at: http://www.hormone.org/diseases-and-conditions/womens-health/polycystic-ovary-syndrome. Accessed July 25, 2018. Stadmauer L, Oehninger S. Management of infertility in women with polycystic ovary syndrome: A practical guide. Treat Endocrinology. 2005;4(5):279-292.